Cabo de Gata in the Nijar region is Andalucia’s largest coastal protected area, a wild and isolated landscape with some of Europe’s most original geological features. It is the only region in Europe with a true hot desert climate. The scenery is indeed breathtaking with huge craggy mountains and vast open spaces. The villages are scattered and tiny. We had heard that it was possible to free-camp at La Isleta Del Moro for a short time so we directed Sally to take us there (36.8167, -2.0522). The car park is quite large but there were only five other vans parked up. We were parked right beside the beach falling asleep to the sound of the waves crashing on to the shore. We had a wander into the village where small fishing boats where pulled up onto the shore. The coastline around Cabo de Gata is breathtaking and the Mediterranean is a band of turquoise. On the way back to the van we were passed by the huge German overlander which parked right at the top of the headland above the car park. Alan and I were just agog at the size of this thing. The side lockers were level with my head, the tyres were almost the height of me and as you can see from the picture it was one mean looking truck. I’d have paid money to get a look around the inside although I’ve been told they can be pretty utilitarian – but I’d have loved a wee look. We moved on into the park to take more pictures a Los Escullos, As usual the photos don’t do any justice to the scenery at all. You get no idea of the vast emptiness of the place, silent with the occasional eagle soaring overhead. I love these places away from the tourist trail – there such a sense of peace about them. Because of the remoteness and the wild and rugged nature of this part of the coastline, it was a favourite hiding spot for pirates after their raiding missions and is now referred to as the Costa de Pirates. Although we weren’t bothered by the Police, whilst we were there, we later heard that the motorhomes had been moved on the following evening by the Policia Local. It seems the police will tolerate motorhomes for a while then for no apparent reason clear the car park totally. This seems to be a recurring theme along the coast of Almeria. Campers are being moved en-mass from car parks and beach fronts and directed to local campsites. I’m not sure what the thinking is behind this – my view would be that in the winter the car parks and beach fronts are empty of tourists so encouraging motorhome owners to camp and spend in the towns is a win/win for everyone, Unfortunately the authorities don’t see it like that it seems. Moving on down the coast, we stopped at a little town called San José. Again we free-parked in a large car park area along with about 20 other vans. They do allow motorhomes to stay here (36.7644, -2.1121). That evening we watched as several of the vans that had been parked with us at La Isleta arrived having been moved on by the Policia Local. San José is a small fishing village in the central coastline of Cabo De Gata. Over recent years it has seen an increase in the number of visitors and is an easily accessible town from Almería airport and the A7 autovia. 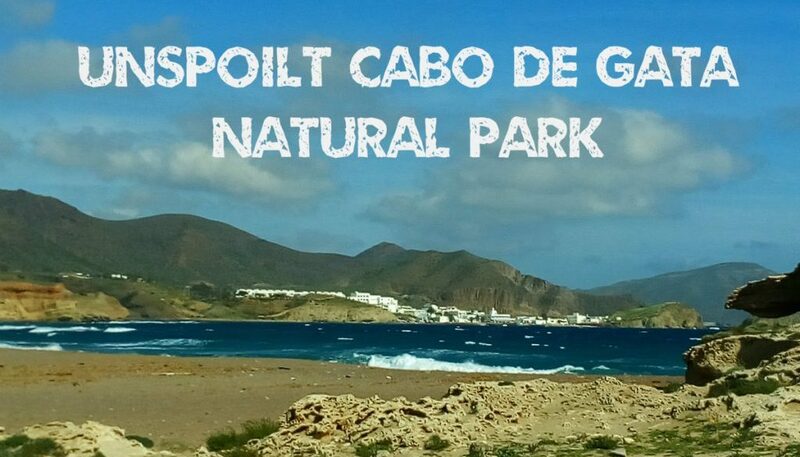 San José, as with all of the Parque Natural de Cabo de Gata is beautiful all-year round but most popular during the spring and summer months. Although San José boasts a few nice beaches, a little outside the town and within walking distance, are some of the most amazing and picturesque beaches which interestingly are mostly nudist. Alan says its still far too cold to be in the altogether on the beach yet, so we gave it a miss – maybe next time 🙂 .